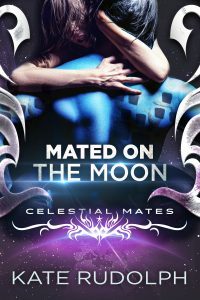 Ruby isn’t looking for love, so when her newly married best friend signs her up for the Celestial Mates dating service, she’s frustrated and ready to swear off dating for good. But out of consideration for a lifelong friendship, she agrees to one date. If the guy she meets is perfect, great. If not, well, at least her bestie can’t hold it against her. Even better, she won’t need to deal with any more matchmaking. Nyco needs a mate and he’s running out of time. As a Detyen, he’s doomed to die on his thirtieth birthday if he doesn’t find his denya. At twenty-nine, he can feel each day ticking by as his end rushes closer. Out of desperation, he agrees to work with the Celestial Mates to try and find his match. He’ll recognize his mate on sight, but all the women being sent his way are completely wrong. Sparks fly from their first encounter, but is it too good to be true? And when outside forces intervene to cut off their bond before it even begins to flourish, Nyco will do anything to prove that he is the only person in the galaxy meant for Ruby, and he’ll fight anyone and take any risk to protect her.